It's best to double-check that before starting! When it comes to source material, it’s hard to get much more authentic than going medieval – and the list of “demons” in the Ars Goetia offers quite a lot of inspiration. Of course, when you read that list you don’t find a lot of game-style “demons”. You don’t find much in the way of berserk killing machines, of evil for the sake of evil, or of random torment. You find pursuers of thieves, teachers, healers, seers, war-leaders – and even war-steeds. A list of entities who… wound up on the wrong side of heaven for one reason or another – apparently rarely for direct rebellion – and who were cast out. There are a lot of reasons why someone can wind up on the wrong side of a war and still be a decent enough person. Traditionally, quite a few of these entities were serving their summoners in pursuit of their own redemption – even if they’re not very good at it and have massive blind spots. For game purposes, most of these entities can be treated as Conceptual Spirits – entities that embody immortal ideas, and so can be in many places at the same time. The summoning rituals open the way for them to manifest – and the more powerful the summoner, the more powerful the manifestation. Favored Form : A stern and fearsome man attired in the clothing of a judge. He occasionally appears with, or sends in his place, one or more terrible black hounds – in reality merely embodied fractions of his own energy and immaterial essence. He has been known to leave one of these “creatures” with a summoner. Major Powers : Grandmaster Psionic (Psychic Senses and Heightened Talents), Powershaping (Nymic Magic and Transformations – only when embodied), Spell Imbuement (Only in living creatures, maximum of seven). He will often bestow a set of carefully-tailored spells to allow a summoner to enact judgement on the guilty. Sacrifices : None required when the summoner is acting in pursuit of justice, otherwise he may require some quest – always in pursuit of justice – in return for his aid. He will also always tell the summoner something about himself or something he’s done that he would really rather not know – most often revealing the undesirable or unjust results of the summoners own past actions. Ritual : Circle, scribed with an oaken rod. Basic Nature : Vengeful and merciless. Andromalius tends to use his “summoners” as agents in carrying out his eye-for-an-eye judgements. It is probably this lack of mercy that put him on the wrong side of the greater celestial powers. Combat Skill : Master of the “Soft” martial arts. Favored Form : A handsome and powerfully built man riding a mighty war-stallion, usually accompanied by martial music. He occasionally simply sends the horse-fraction of his energies, in which case things can get “uncomfortable” for the offering (see below) – unless the “summoner” has a mare – and some splendid tack – ready (which is very, VERY, wise). The horse can be ridden, and is a useful and obedient mount – at least as long as you do a lot of fighting. Major Powers : Master Psionic (Telepathic Powers), Powershaping (Winter and Summer magics), Hypercharisma and Hypermasculinity. Sacrifices : Beleth requires the, er, attentions and companionship of a pretty girl while he’s present. He will leave her psychically bound to the summoner as a personal slave when he leaves (this can actually be very very useful if he arrives in horse-form and is offered a mare). If such an “offering” is not forthcoming, he can occasionally be placated by a supply of expensive weapons, armor, and masculine accouterments. 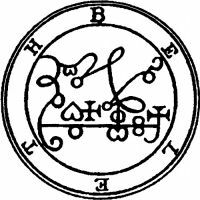 Ritual : Beleth can be summoned through the use of an enruned ring – and an invocation – but it is a very good idea to have inscribed either a protective circle or a containment circle first. Basic Nature : Lustful, hot-tempered – and far too easily enraged. Beleth often arrives in a fury, and can be extremely dangerous if defied. He’s more than a little nuts. Unfortunately for him, he sees nothing wrong in his behavior; is not a mighty warrior entitled to such small indulgences? Combat Skill : Beleth is competent with virtually any weapon but primarily relies on sheer strength and his immense personal vitality. The horse is a powerful steed, although it does have a pesky tendency to teleport right into the middle of combat. Favored Form : Either an insubstantial minotaur with eyes full of stars or a slim, naked, boy. He is very hard for most people to see at all either way. Major Powers : Navigator, Caravan Master, and Inter-dimensional Traveler, Powershaper (Necromancy and Mindsending), and Cultural Adaption. Bifrons is a wanderer of the empyrean plane, and is capable of taking people on a guided tour through almost any afterlife. Sacrifices : If not placed with the gift of some means of transport (Horse, boat, car, plane, whatever) Bifrons has an annoying tendency to drop off those who travel with him in an inconvenient location. Summoners who simply want him to use his necromantic or tutoring talents on their behalf may either undertake a “brief” empyrean combat/quest or placate him with simple cash – although, unless things have changed recently, Bifrons does not take paper money, credit cards, checks, or letters of credit. He insists on gold and silver coins. Ritual : The summoning circle must be drawn in the earth, either outside or in some public place – such as an inn. The summons also requires mold from a graveyard, and all negotiations must be completed within seven minutes – or Bifrons will travel elsewhere. Basic Nature : Irritating. Bifrons is a know-it- all, and delights in telling endless stories about his travels elsewhere – and how they were so much more interesting and dramatic then whatever is going on at the moment in his summoner’s life.